Ryumon Forged AISI 1060 Samurai Ninja Sword With Scabbard | BUDK.com - Knives & Swords At The Lowest Prices! It doesn"t get much better than this show-stopping Ryumon ninja sword. This is a fully functional work of art, featuring a 28" AISI 1060 high carbon steel blade that has been hand sharpened and honed to a razor's edge. 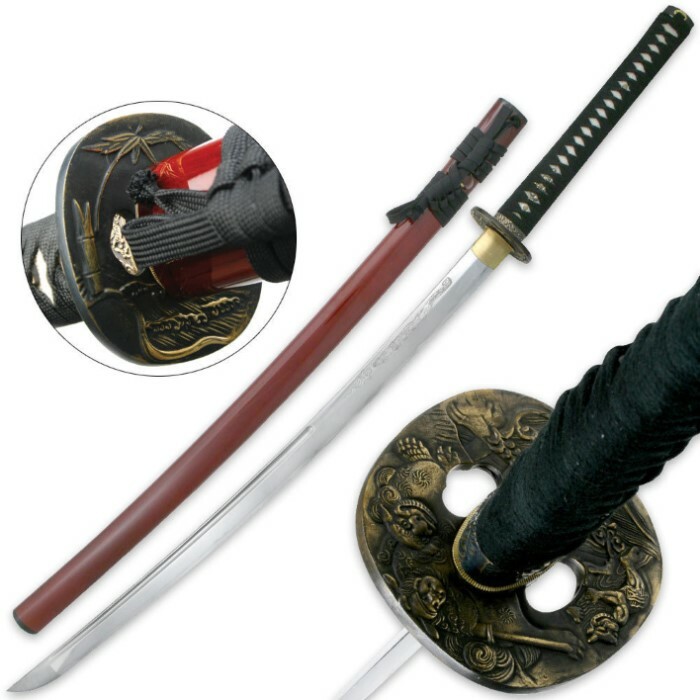 A heavy blood groove spans the second half of the blade in true samurai fashion, and a brass habaki blade sleeve leads to the ornately designed handle. The authentically designed tsuba, fuchi and kashira are all made of cast iron with an antique finish to handsomely accent the genuine ray skin and cord-wrapped handle. It comes to you with a coordinating scabbard, certificate of authenticity and cleaning kit. This is simply a beautiful sword. Well made, tight, good furnishings, excellent blade. Could be a little sharper but not a big problem. Excellent value for the money too. The sword arrived on time and was exactly as described. Excellent value. Beautiful, sharp, and exactly as advertised. Wished I had purchased a display stand as well. In addition, outstanding customer service from True Swords. Couldn't be more pleased. Purchased this sword 01/04/12 i have to say it is simply amazing you must buy this sword i can't describe how great it is but the quality is simply amazing its slightly heavier than most katana's but that is because the blade is slightly thicker for cutting power it comes extremely sharp you can feel the power that this blade possess in your hands i promise you will not be disappointed for the price this katana is perfect i have looked around at every site there is sites selling this katana for 350 bucks trueswords sells for 219.99 you must buy it seriously!